Just like the foods we eat, many of the beauty products we use can contain synthetic chemicals that can be harmful to our health and wellbeing. According to the Environmental Working Groups (EWG), ‘the average adult uses 9 personal care products each day, with 126 unique chemical ingredients’. That’s a huge amount of chemicals that we are exposed to, which can be absorbed straight into our bodies through our skin. Why are chemical ingredients harmful? For more information about chemical ingredients I encourage you to browse through the Environmental Working Groups (EWG) webpage. They have a great range of research, resources and guides that provide information to help us live a healthier life. Do natural products actually work? Standard shampoos are often comprised of a cocktail of chemicals. Check your hair products for Sodium Lauryl Sulfate (SLS), a cheap foaming agent that is extremely drying and harshly removes oils from both the skin and hair. 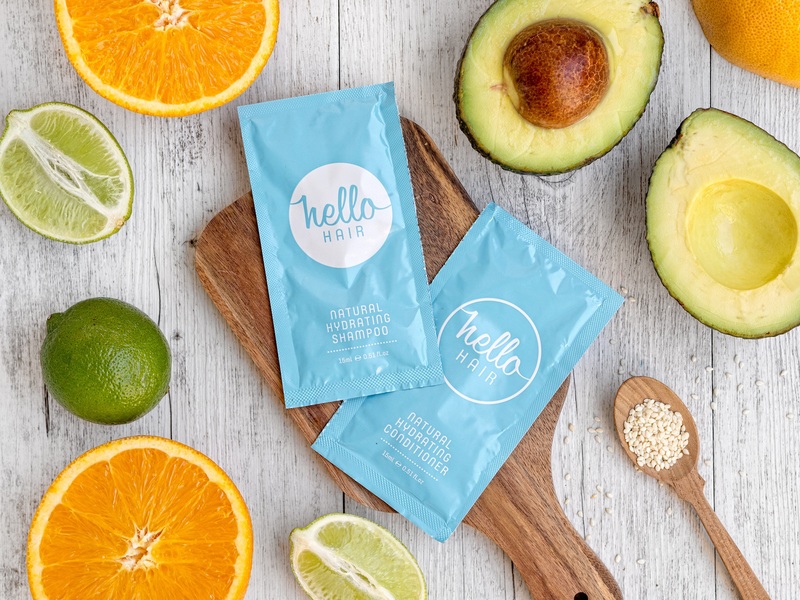 Hello Hair’s shampoo and conditioner is a gentle alternative that will give you that clean hair feeling without any nastiness. It has no sulphates, harsh detergents or synthetic fragrances and uses certified organic oils to keep your hair hydrated. If you suffer from dry or flakey skin, then coconut oil is your perfect natural beauty swap. What could be better than a moisturiser with just one natural ingredient? Coconut oil is very hydrating and has amazing antibacterial properties. Simply apply the oil to dry skin and enjoy the benefits. In the past I have struggled to find a mascara that didn’t cause irritation or redness to my eyes, until I was introduced to the Ere Perez Mascara over five years ago; and I’ve never looked back. The Ere Perez Natural Almond Oil Mascara is a perfect solution for sensitive eyes. It contains absolutely no chemicals, no synthetic ingredients and is vegan friendly. This mascara’s base is almond oil, which is a rich source of vitamin E and will ensure your lashes stay strong and hydrated. Paw paw extract is an extremely healing ingredient that is the star of many lip balms and ointments. However, paw paw is not quite so beneficial when mixed with 96% petroleum jelly (a highly refined oil industry by-product), which is often the case in many commercial brands. Swap your petroleum-based product for the little yellow tube of Suvana goodness. It’s made from coconut oil, honey, paw paw extract and vitamin E and will leave your lips feeling hydrated and healthy, without any toxic by-product. I’m going to make a big statement here, but I believe that Dr. Bronner’s Liquid Castile Soap should be a staple in every home. Free from parabens, foaming agents, whiteners, synthetic fragrances and with no detergents, this multipurpose soap is a fantastic alternative to chemical-filled brands. I personally love the peppermint soap, which is wonderfully refreshing and cooling. Go green by swapping your standard nail polish to Butter nail polish. Most standard nail polish products contain harsh chemicals including formaldehyde. Formaldehyde is a harsh, strong-smelling chemical that is used to extend shelf-life and prevent bacteria growing. It is considered carcinogenic and is a common skin irritant. While even so-called natural nail polishes still contain chemicals, Butter is a friendlier alternative for perfectly manicured nails.